Ha! Love the little slang that develops in a family. Especially when it is a rarely used word like that one 🙂 Almost like using pig-Latin! Last? What? What hasn’t that little imp told me??? Hmm, perhaps she just doesn’t want to play our little game anymore and thought she could shut us down…. Agh!!! The little bastards ARE ubiquitous!!!! I love your burger! Awesome way to interpret this prompt! That’s great, I love it, and I am more than interested to check out Sugartooth later when I have more time. What made you think this was the last challenege?? Did you tale my first paragraph up wrong, ya eejit ya? You’re a total eejit, you know that right? but i loves ya! I know! I was in a funny mood last night. I’m guessing not funny ha ha? Well I’m going to the pub in a bit, maybe that will cheer me up! I thought the post was great ya rocket lol nowt wrong with it! Lovely! That’s a hamburger you can eat guilt free. Love this concept! Now, I will take one to go please,with fries/chips/whatever. Curry chips with cheese! Mmmmm. 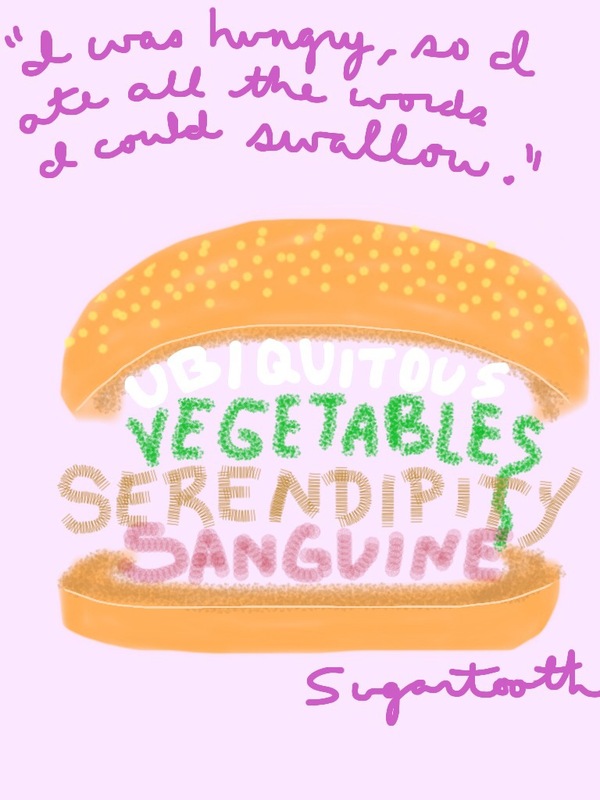 Serendipity is the title of a movie that I highly recommend. It’s a romance, but it stars John Cussack, so you know it’s not your average romance. Nobody dies in there though. I love the word since I saw that movie. Not that I totally understand its meaning though.